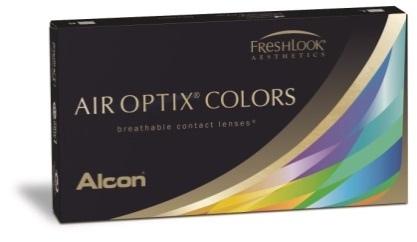 "Alcon, the global leader in eye care and a division of Novartis, announced today the launch of AIR OPTIX® COLORS prescription contact lenses, a new color contact lens that encapsulates Alcon’s 3-in-1 Color Technology in a silicone hydrogel lens. Available in nine colors ranging from subtle to vibrant, AIR OPTIX® COLORS contact lenses are the first monthly-replacement, daily-wear color lenses available in the U.S. on a silicone hydrogel platform, allowing up to six times more oxygen through the contact lens compared to the leading, older technology color contact lens.1* The natural-looking color is contained within the innovative lens material, so that the only thing touching the wearer’s eyes is the ultra-smooth permanent plasma surface of AIR OPTIX® brand contact lenses. Contact lens wearers can enjoy beautiful, comfortable lens wear. " I've made a few changes to the plaquenil risk calculator. A few of the changes were in the interest of user-friendliness, but the more important changes are as follows. I removed the chloroquine calculations. I can't recall the last time I saw a patient taking this (as opposed to hydroxychloroquine) and I feel presenting it as an option was only a potential source of confusion or errors. I included some sliders for adjusting height and weight for BMI calculations. On the surface this may seem cosmetic but it also allows for our metric system users (which I call the "smart ones") to enter these values in kilograms and meters instead of ponds and feet/inches. I made the cumulative Plaquenil dose calculator a bit more robust. It originally only accepted a dose and a duration in months and years. However, I realized that 1) Sometimes dosages change and 2) sometimes doses are irregular. For example, if a person takes 400mg bid x 1 year, then changes to 200mg qd x 1 year, you can now add rows to the calculator by pressing the "+" button. You can do this as many times as you like. In addition, I realized that I was seeing a lot of patients that were taking dosages like this: 400mg every other day, with 200mg on the opposite days. I added a "qod" sig option that can cover these more difficult prescribing patterns. Hopefully that'll cover the majority of our needs for these calculations. If you run into any other commonplace scenarios that I haven't covered please let me know. SAUFLON ANNOUNCES INTRODUCTION OF WORLD’S FIRST AND ONLY FAMILY OF SILICONE HYDROGEL DAILY DISPOSABLE CONTACT LENSES TO THE UNITED STATES MARKET. NEW YORK, Jan. 13, 2014 — Sauflon, the world’s fastest growing contact lens company, today announced that it is entering the U.S. contact lens market with its award-winning clariti 1 day silicone hydrogel daily disposable contact lenses. As the world’s first and only family of sphere, toric and multifocal silicone hydrogel daily disposable contact lenses, clariti 1 day is able to satisfy the broad range of practitioner and patient needs. Sauflon’s breakthrough AquaGen™ technology produces high quality silicone hydrogel lenses that provide exceptional comfort and affordable convenience for the wearer. 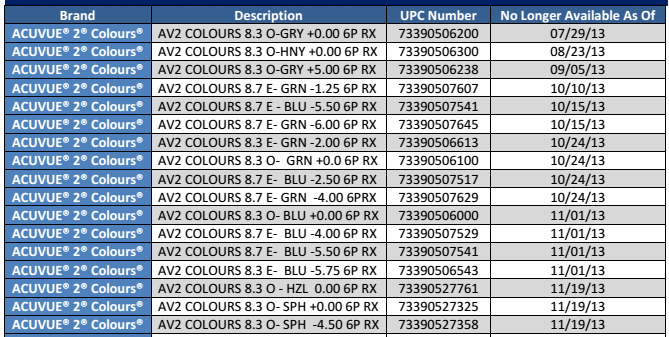 I’ve spent the last decade writing contact lens calculators, cataloguing contact lenses, and writing code to search and display contact lens information. After all the nights and weekends hunched in front of my computer, and despite the fact that I’m proud of what I’ve created, you might be surprised to hear what I say next: I wish there was less need for EyeDock. Yup, you heard me. I feel that a site like EyeDock should be a little superfluous. I’ve felt this way since our clinic switched to an EMR 5 years ago. Mind you, I’m not using one of the cool optometry-specific EMRs that a lot of you are using. My EMR is Epic, which does cardiology, oncology, pretty much everything else, and eye care. I actually think it’s good for what it is, but it’s not tailor-made for ODs. If you still have patients wearing Acuvue Colours you'll want to know the supplies are starting to decline. Vistakon is discontinuing these lenses and other older products. The following lenses are already unavailable.